This Order is to be awarded to South African citizens who have excelled in the fields of arts, culture, literature, music, journalism and sport. 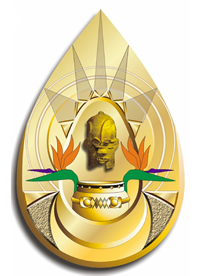 The Ikhamanga (Strelitzia) plant symbolises the unique beauty of achievements by men and women who carry the colourful South African aloft in the fields of creativity, arts, culture, music, journalism and sport. Lydenburg Heads - (the arts) - the terracotta head represents visual, creative arts, performance and drama. African drum - relevant to all cultures and representative of the arts, it symbolises excellent talent in communication and cultural celebration. Crest/Sun - the crown symbolises a feathered head-dress worn by performers, royalty and respected people. The rays of the sun, which denote power, glory, illumination and vitality, represent the achievements of performers in various fields. Inner ovals or borders - (glorification in sport) - they symbolise the acknowledgement of exceptional achievements in various sporting and cultural activities. Roads - (achievement and success) - portray all roads leading to Africa and the Cradle of Humankind, which emphasises the long, hard road to achievement, excellence and success.